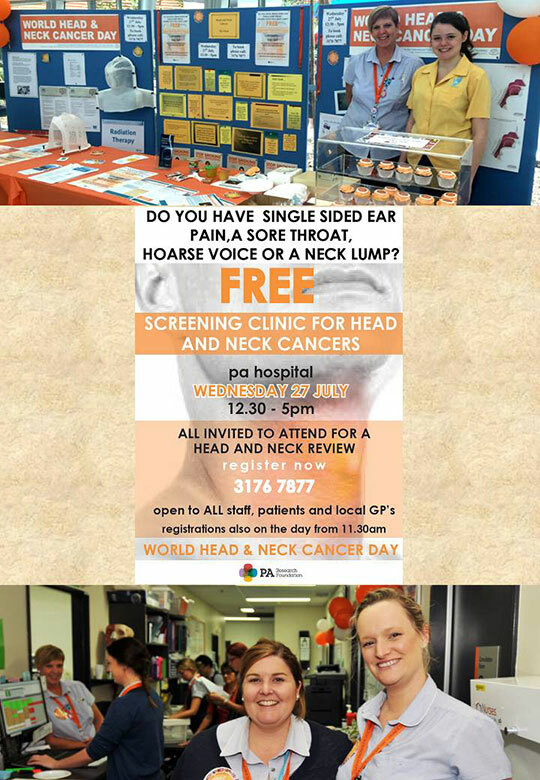 To celebrate World Head and Neck Cancer Day the Princess Alexandra Hospital ENT Department (Brisbane) hosted a free screening clinic. The clinic was bustling with 92 attendees checking-in. Doctors Ben Panizza, James Bowman, Scott Coman, Chris Perry, Matthew Ward and Leon Kitipornchai and the Outpatient Clinic Nurses were kept busy tending to those who presented. A high percentage of attendees completed patient satisfaction surveys (80%), with very positive feedback from all. Significantly, the clinic was successful in identifying 40 patients requiring follow-up and further investigation. In addition, the ENT Department hosted a stall in the hospital foyer promoting awareness of Head and Neck Cancer to the broader community.